We developed a new, more functional floor plan by removing the wall between the kitchen and laundry room. All walls in the new kitchen space were taken down to their studs. New plumbing, electrical, and lighting were installed and a new gas line was relocated. The exterior laundry room door was changed to a window. All new energy saving windows were installed. A new tankless, energy efficient water heater replaced the old one, which was installed, more appropriately on an exterior wall. We installed the new sink and faucet under the windows but moved the range to the west end wall. In working with the existing exterior and interior door locations, we placed the microwave/oven combination on the wall between these doors. At the dining room doorway, the new 42" refrigerator begins the run of tall storage with a pantry. As you turn the corner, the new washer and dryer are now situated under new upper cabinets. Seating is provided at the end of the granite counter in front of the window to maximize and create an efficient work space. The finishes were chosen to add color and keep the design in the same time period as the house. Custom colored ceramic tiles at the range wall reflect the homeowner's love of flowers: these are complimented with the tile back splash that continues along the length of peacock green granite. The cork floor was chosen to blend with the adjacent oak floors and provide a comfortable surface throughout the year. The white shaker style cabinets provide a neutral background to compliment the new finishes and the owner's decorative pieces which show nicely behind the seed-glass cabinet doors. Task lighting was installed under the cabinets and recessed LED lights were placed for function in the ceiling. 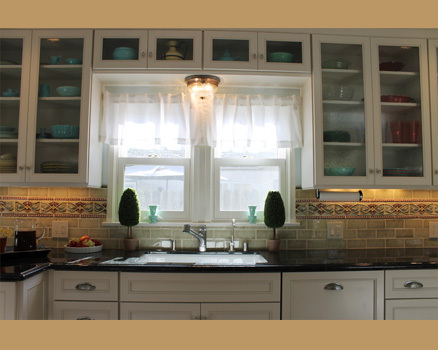 The owner's antique lights were installed over the sink area to reflect her interest in antiques. An outdated, small and difficult kitchen and laundry room were made into a beautiful and functional space that will provide many years of service and enjoyment to this family in their home.